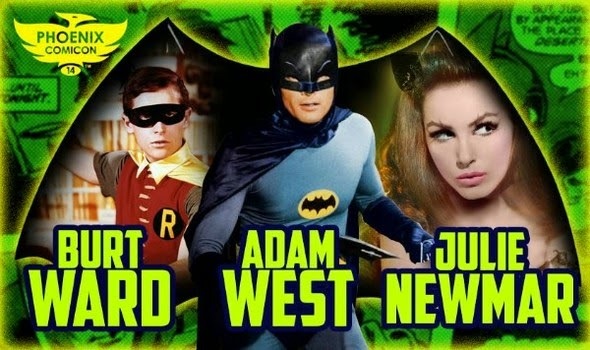 Phoenix Comicon is proud to announce that actors Adam West, Burt Ward and Julie Newmar will be attending Phoenix Comicon 2014. “We are thrilled to have Adam, Burt and Julie give Phoenix Comicon a huge “POW!” and “BAM!” of fun for this year's Convention,”says Convention Director Matt Sorberg. Adam West is best known for his role as Bruce Wayne and his crime-fighting alter ego, Batman in the television series Batman from 1966-68. A film version was released in 1966 as well. West often reprised his role as Batman/Bruce Wayne, first in the animated series, The New Adventures of Batman, and in other shows such as Super Friends: The Legendary Super Powers Show and The Super Powers Team: Galactic Guardians. In 1979, West once again put on the Batsuit for the live-action TV special Legends of the Superheroes. In 1985, DC Comics named West as one of the honorees in the company's 50th anniversary publication Fifty Who Made DC Great for his work on the Batman series. Most recently, West has done voice over work, most notably as a fictional version of himself as mayor of Quahog, Rhode Island on the animated series Family Guy. Burt Ward is best known for his portrayal of Robin in the television series Batman (1966–68) and its theatrical film spin-off. At the height of Batman's popularity, Ward recorded a series of tracks under the production of Frank Zappa. After the end of Batman, Ward re-emerged to act in more than 30 made-for-television films. In 1985, DC Comics named Ward as one of the honorees in the company's 50th anniversary publication Fifty Who Made DC Great for his work on the Batman series. Ward appeared in numerous reunions with co-star Adam West. The most memorable included reprising their roles as Batman and Robin on the animated series called The New Adventures of Batman, the television theater show Legends of the Superheroes, and the 2003 television movie, Return to the Batcave: The Misadventures of Adam and Burt. Currently, Ward continues to promote work for the charitable organization called Gentle Giants Rescue and Adoptions, Inc. that he and his wife founded. Julie Newmar is best known for her portrayal of the "purrfect" villainess, Catwoman in the television series Batman (1966–67). Newmar famously modified her Catwoman costume, which is now in the Smithsonian Institution. Her extensive career in television also included appearances on the series' Bewitched, Star Trek, The Beverly Hillbillies and The Twilight Zone. In addition to her work in television, Newmar has appeared in several films, such as Seven Brides for Seven Brothers, Serpent of the Nile and The Rookie. Newmar is also an accomplished stage actress, and won a Tony Award for Best Supporting Actress for her role of the Swedish vixen, Katrin Sveg in the 1961's Marriage-Go-Round. The The 1995 film To Wong Foo, Thanks for Everything! Julie Newmar pays homage to the actress. In 2003, Newmar appeared as herself in the TV-Movie Return to the Batcave: The Misadventures of Adam and Burt alongside former Batman co-stars Adam West and Burt Ward.